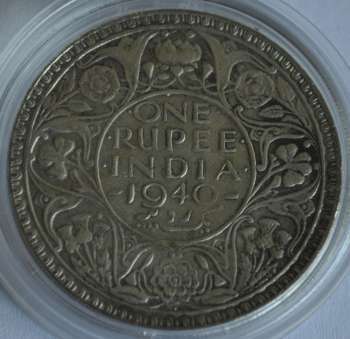 The legend within a single line circle: ONE RUPEE INDIA and - 1940 - Surrounded by a saracenic scroll composed of conventional representations of a rose, thistle and shamrock. At the top and bottom are different representations of the Indian lotus flower. All this is within another plain circle. All within a raised, decorative-toothed border. (Yek rupiya = One rupee in Persian). Crowned head of the King facing left and surrounded by the legend: GEORGE VI KING EMPEROR. All within a raised with decorative-toothed rim. Second Large Head with small rim decoration. Mintage Years: Mumbai (Bombay): 1939-1941 and 1943. King George VI ruled from 12 Dec 1936 to Indian Independence on 15 Aug 1947. After the death of King George V his son, King Edward VIII became the King, but abdicated before the coronation. No coins were minted using his portrait. 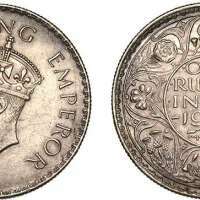 His younger brother the Duke of York was crowned as King George VI in May 1937 and the first coin of India with his effigy was minted in 1938. After the outbreak of World War II in 1939, the price of silver started going up, in practice the silver coins became valuable then the value written on them. This led to reducing the use of silver in coins. The 1940 1/4-Rupee, 1/2-Rupee and One Rupee coins were reduced from 0.917 silver to 0.500 silver (there were a limited number of 1939 Rupees minted in 0.500 silver). Mainly there is no mint mark for Calcutta, the Bombay issues have a small raised dot or diamond (commonly known as reverse B) under the lotus flower, near the bottom of the coin and the Lahore mint used a small "L" in the same position. 1. In First Head the two fleurs de lis on the royal crown are larger and extend upward to touch the beaded crest at the top of the crown, while the two fleurs de lis on the crown of the Second Head are smaller and extended upward to touch only the line on the crown below the beaded crest. 2. In First Head with high relief the lines coming upwards from the center of the crown are curved and touches the beads. Second Head with low relief has straight lines, coming upwards from the center of the crown and does not touch the beads. 3. First Head with high relief has large triangles on left and right in the center of the crown while there are smaller triangles for Second Head with low relief. 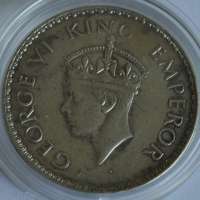 I have georse 6 king emperor 1 rupee coin 1940. I have one coin. What is the value of this coin ? I want to sell this.